First, sterilize your jam jars: wash them in hot soapy water, rinse them, then put them upside down in an oven at 100°C/200°F/ gas mark 1⁄2 until they are hot and dry. Or, put them through the dishwasher on its hottest setting. Measure the fruit liquid into a heavy-based pan. For every 500ml (17fl oz) liquid, add 375g (13oz) sugar. Place the pan over a low heat and stir the liquid until the sugar has dissolved, then bring it up to a rolling boil. Boil for 8–10 minutes, then start testing for setting point. To do this, turn off the heat, spoon a few drops of the jelly onto a chilled saucer (from the fridge) and return the saucer to the fridge for 2–3 minutes. 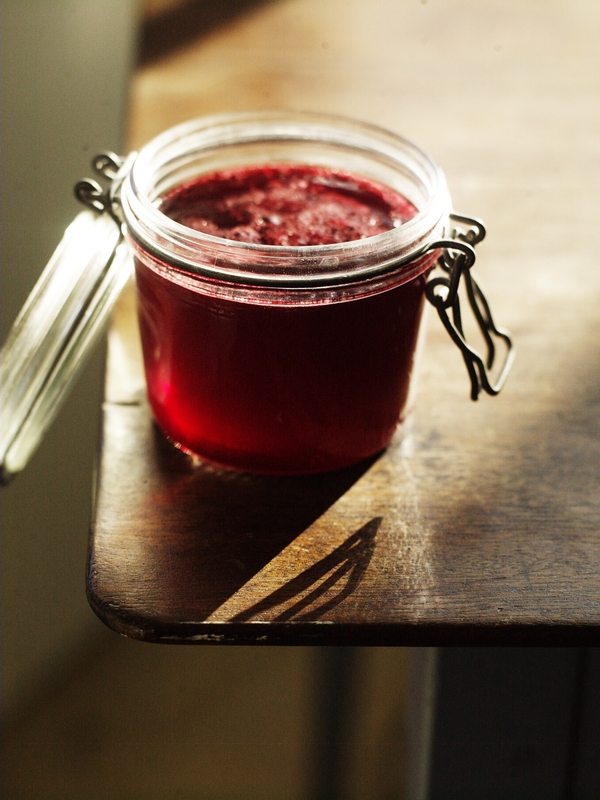 Push the chilled drops of jelly with the tip of a spoon; if the surface wrinkles, you’ve reached setting point. If not, boil the mixture for another 3–4 minutes and test again.